The recent retro trend dug out many stories of the 80's and 90's computer game development and some people mix up my role and involvement into it. Even official magazines writing about the history of those classic titles like Turrican & Katakis got it wrong on some points. So let me make a short time travel into 1987, where I started as Development Director of a company called Rainbow Arts. I was hired because I brought cool games to the company. The first was a game from a friend of mine called Sarcophaser, where I also did the graphics & level design. In order to understand the sequence of events I need to tell the story of that year and the one before. While I did the graphics & levels for Sarcophaser I also had a side project I programmed AND did the graphics: a R-Type clone. R-Type being my favorite arcade I wanted to replicate it on the Amiga. I showed my demo on a cracker meeting (we all id do this in the 80's) and another group was amazed and showed me their demo: while theirs looked worse it ran in 50 frames per second, while mine looked nicer but only worked in 25 fps (this is important for later on, read on). So when I started my job I contacted that group immediately and wanted to buy their game to publish. That group agreed (I think the price was 25.000 DM, about 13.000 Euros). The name of the group was Lightcircle but they didn't want to use their cracker/demo scene name for a published product, so they called themselves Factor 5 - as there were 5 original members. Remember the game was on Amiga only. Meanwhile a wonderboy single person game writing machine called Manfred Trenz did a shooter on Commodore C64 called Katakis which was totally overkill for that 8bit machine. Looking for marketing synergies we called Lightcircles Amiga game also Katakis although they didn't have anything in common but being a sidescrolling shooter. The official R-Type license was bought by Activision (the old UK one, not the new one of today) and they saw our Katakis and got annoyed as their conversion really sucked (as most arcade conversions used slave pens who ported games under 3 months but with bad quality) - so they sued us. A deal was made: we port R-Type to C64 and Amiga in exchange that we can rerelase Katakis, which they pulled off the shelves. We agreed and under 3 months time we worked on our dream arcade license and ported it to C64 and Amiga. The Amiga version was done by Factor 5 and myself as producer. The one important call I made was to leave the game in 25fps but have the players ship in 50fps. This made sure we didn't waste time on technology for 50fps but did finish in time. We did it in 2.5 months. Anyway, after the Activision / R-Type adventure and having 2 hit games under the belt we asked what to do next. It was obvious we wanted to go further and so we looked again back at the one man single development superman Manfred Trenz: he meanwhile developed another shooter, this time inspired by Metroid: a 8 way scroller shooting game on C64 called Turrican. Factor5 should make the conversion to Amiga. The challenge was to develop a technology in 50fps which can support 8 way scrolling. The final idea to make this possible was between Holger Schmidt and me in a Pizza Hut in Köln, we drew the principle on the back of a Pizza Hut paper. Note that 8 way scrolling and many objects was close to impossible on the C64, but Manfred pulled it off. About half into the project a problem surfaced: Rainbow Arts was so successful that we had too many projects going. I couldn't manage 17+ projects all by myself (I was the only manager in development) so I turned to our business partners in the USA and asked around how they do it. They had someone called "producer", an unknown concept in Germany until then. Yes this sounds funny, but remember these were different times, a development team consisted of less than 5 people compared to todays 50-500. So we started to look for producers and came to the conclusion that game magazine writers would be ideal as they knew many games, right? So we went down to the most popular magazine Powerplay and hired all their three important writers: Boris Schneider, Heinrich Lenhardt and Martin Gaksch. All but one started working for me - Heinrich being the one who chickened out. Boris was assigned to all Lucas Film Games products and Martin did a game called Rock'n Roll, which still has great memories today (he was a big Rock'n Roll music fan). So to find a replacement for Heinrich we got lucky as our Partner EA Lucasfilm Games (yes we distributed EA Lucasfilm Games at that time) was calling us to look at a young guy who annoyed them that he wants to work for them but they don't have room for him. So we looked at this guy and he was called Julian Eggebrecht - and we hired him. So, here it is. I was involved in Katakis, the R-Type conversions and Turrican Amiga, although some people claim I wasn't. You can verify this story with anyone working on these projects, even Manfred Trenz himself. And no, I didn't do much on the C64 versions as Manfred had zero social skills at that time and was a wonder machine with no need of interference. And yes I was responsible shipping over 75 games in just 3 years time - different times they were. Boris Schneider meanwhile is married with kids and works since years for his favorite company Microsoft. Heinrich Lenhardt lives in the US and still writes for some German magazines and web pages. 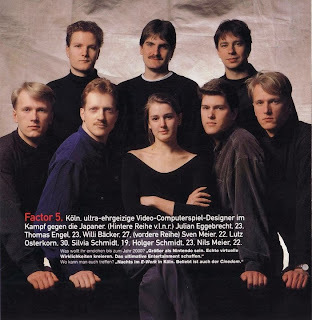 Factor 5 went broke despite having huge success with some of their console games and was split: the German part still exists as a service company for game programming and is led by Achim Moller, the original programmer of R-Type Amiga and Katakis Amiga - and works also for Ubisoft Blue Byte on mobile games. The US side of Factor 5 is gone and the refounded company with the original founders and Julian Eggebrecht now works on players of TV streaming for your console, so yes, if you watch TV on your console chances are high that the old Factor 5 programmers wrote that piece of software. The founder of Rainbow Arts Marc Alexander Ullrich later founded Strato, the largest German domain seller and internet provider, which he sold for millions later on. He enjoys his riches now and enjoys his hobby as a photographer. The story of "Citadel of the Black Sun"
The Story of "The great Giana Sisters"